A ring light is a set of light bulbs formed into a circle, which commonly use to photography, portraits, and beauty shots. 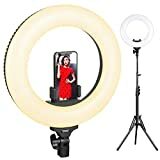 You favorite vloggers may be using a ring light withstand when they are shooting your favorite vlogs because it serves as an economical lighting tool with their indoor vlogging. 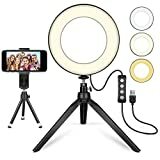 If you want to start vlogging, or in need of the ring lights with stand, here is a list of the best ring lights with stand in the market today. The LED ring light from FOSITAN has built-in 180 pieces of SMD LED beads and it produce an outstanding 3800LUX at@1m lighting power with broad dimming range from 10%-100%. 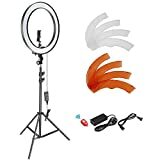 It has 2 color filters which are orange 3200K and white 5500K, perfect as lighting to your photography, video shooting, hair and makeup salon, selfie portraits and many more happenings that need handy lights. The light ring consumes a power of 45 watts and equipped with a stand that has 1/4 inch standard screw thread above it. The stand is made of aluminum alloy, and it is foldable and adjustable with height ranges from 31″ to 80″. The 3 legs’ purpose is to keep your stuff safe without wobbling when in use with the help of the solid locking system. The 180 degrees adjustable head of ring light is perfect for some multi-angle shooting; the maximum weight that the tripod can bear is up to 3KG. You can rotate your phone without taking it out of the adapter with the 360-degree rotatable phone holder, and the good thing is it is compatible with most of the smart phones today. For DSLR users, there is a designed adapter to use. CRI>90 that delivers super bright white light and soft natural yellow light. This ring lights from SAMTIAN uses 336 SMD LED halo lights with a summation of 45W power output. The ring light possesses a dual color setting that you can adjust from 2700K-5500K color temperature without the use of color filters. Adjust the 2M light stand that is made from aluminum alloy that can rotate 180 degrees, and is recommended to stretch it up to 1.6m. The different brightness will meet your style in different shooting environments and effects with a dimming range from 10%-100%. The package includes the LED right light and stand, white diffuser, Smartphone holder, remote control for smart phones, hot shoe adapter, power adapter, and a portable black bag. The mini LED right light with stand from MACTREM is only 6″. It has 11 brightness levels in 3 different light modes. 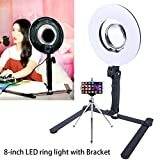 If you need some extra lighting for your make-up session, taking photos, vlogging, or anything that needs some light this one is perfect to bring anywhere since it’s small and handy. 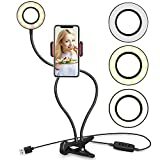 It has a universal Smartphone holder that is very easy to use, compatible with most of the smartphones today, and powered by USB to enjoy the ring light with stand any time. There are 3 light modes, the white, yellow, and warm yellow. Choose the light mode that will suit your taste. There is a switch in the cord to power it on and off, and adjust the light mode and brightness level. The tripod is also adjustable, and the ring light is rotatable up to 360 degrees. This dimmable right light with stand from Neewer uses fluorescent light instead of LED lights. The 10″ ring-shaped fluorescent has a power of 50 watts. The adjustable stand is an aluminum alloy with an apex height of 6.23ft and can carry up to 13.5lbs. To adjust the stand simply unloose the lock and tighten it to your preferred height of the stand. The kit includes the 14″ 5500K right light, 6ft light stand, lights, soft boxes, umbrellas, and backgrounds. Perfect for people using DSLR on photo shoots and video shooting to add some more lighting effect. Start your passion right with this 14″ right light with stand from ESDDI. Lighting is important when taking pictures and videos that is why to get the perfect lighting that you need for your photo shoot and video shoot, it has an adjustable color temperature from 3200K up to 5600K. It uses fluorescent lighting that is dimmable from 10% up to 100%. The high CRI >90 is closer to the true color. To adjust the brightness, just scroll the built-in knows, there is no need to install color filters. Suitable for most Smartphones and cameras, since it includes a hot shoe adapter that can hold 55-78m wide DSLR cameras and smartphones. The outer shell is made from ABS while the adjustable stand is an aluminum alloy. This is a professional tool for vloggers, hair and makeup artist, and even normal people who only want a good picture. It features 3 different light colors with 9 levels of brightness, adjusts it depending on your need. The 24 each cold and light LED supports the 3 light changing mode, and they are warm, cold and mixed light. The unique gooseneck design makes it more exciting to use. You can place it whenever you want since it does not look like the common ring light with stand, you can also use it as a bedside lamp, just lamp on a desk. Very easy to use since it has 5 switches on the control and supplies power through USB, so you can plug it anywhere with the USB port. The right light from TRUMAGINE consists of 120 SMD LED lamp beads and placed evenly with no dark corners to provide the right lighting without the annoying humming and flickering. This right light with stand can last for almost 100000hrs life span with a power of 24W. Dimmable from 1%up to 100% and with a color temperature of 5500K, it meets your requirements in different circumstances. The stand is not the usual ring light stand that we see. It has two foldable arms and designed with compact desktop size, which means it will not eat up too much of your space when using and storing. The materials used for the stand is an aluminum alloy that ensures you a good quality service without getting rusty and can support the right light without falling. The mini tripod clip is compatible with most of today’s Smartphone. The 120 dimmable LED right light from Konseen has a total of 24W power output. The beads are properly placed inside without any dark corner with a broad dimming range from 1%-100% and have a service life span of over 50,000 hours. It provides color temperature of 5500K perfect for your selfies, video shoot, and hair and makeup gigs. The ring lights with stand included are made of durable ABS shell. The package includes the ring light, desktop bracket, a mirror, power adapter, mini tripod, mini hex spanner, and phone clip. 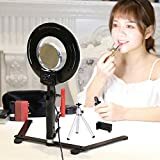 The 3.5″ portable mirror is necessary for makeup artist. The flexible right light from UBeesize will help you to get beautiful shots even at night and at darker areas. Vloggers, photographers, hair and makeup artist uses this tool to get the perfect lighting that they need. When it comes to flexibility, the 24″ long gooseneck arm can bend to any shape you want, and the rotating lazy bracket clip can rotate up to 360 degrees. With that, you can adjust to any angle depending on your needs, and free your hands. The multiple brightness setting is to get the right lighting that you need for the perfect look. Choose from the 3 colors and 10 levels of brightness with your preferred color and brightness. There is a control on the cord to control the ring light. Connect it to any USB port to function, no need for any battery, and it works well with most of the Smartphone. 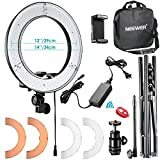 Get the perfect shots with perfect lighting with the best ring lights with stand from Neewer. 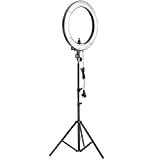 This RL-12 is a 14″ ring light with stand that provides 5500L LED ring light. It helps you to get your best shot when making videos for your vlogs, taking photo shoots, doing makeup and makeup tutorials, or even just taking a selfie. The stand is 61″ long and adjustable. Just loosen up the lock and adjust to your desired height, and lock it again. There is a Smartphone holder included to allow you to use your mobile phones is capturing photos. The dimming range is from 1% up to 100% with white and orange color filters with steady color temperature. The hot shoe adapter is for DSLR users. 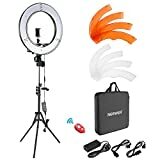 This dimmable LED ring light with stand from Neewer is perfect for people who always use their camera in taking pictures, and videos. Right lights are commonly used in photo shoots, video shoots, and many more. You can choose between two lighting mode, the white and orange filters made from high light transmission plastic with steady color temperature. There are 240 pieces of LED bulbs with a broad dimming range of 1% to 100%. The ring light stand is 61″ tall, and adjustable made from aluminum alloy that gives strength and ensures you that your ring light and device are safe and balanced. It is compatible with both DSLR cameras and Smartphone since it has a separate holder for both. Our best Ring light with stand from Neewer is an 18” ring light made of SMD LED. This dimmable ring light has 240 pieces of LED light bulbs with a wide dimming range of 1% up to 100%. It has two color filters, white and orange for changing effects. It included a 360-degree rotatable phone holder so you can use your own Smartphone to capture pictures and videos. When it comes to the support stand, it includes a strong and durable aluminum alloy stand with a locking system to keep your gadgets safe without any wobble. You can adjust the stand from 36.2″ up to the maximum height of 78.7″, and equipped with a screw thread at the top. Ring lights with stand are very useful, especially for professionals. They can bring a handy tool wherever they want since it is collapsible and handy. It is a good investment for people pursuing their dreams like photography, videography, vlogging, hair and makeup gigs, and many more. All these items on our list are proven and tested to be the best ring lights with stand 2019 in the market today.